continue reading "2012 Pierate Pie-lights!" So with all the visitors – “Andy”, Dan and Mandy, James, Jeremy, Mark, Seth and Stu (and Barnaby via text) – having tucked into the Melon starter and Roast Turkey dinner, it was time to bring on (and somehow find room for) the pie and custard. A quite massive “Specially Selected Luxury Apple Pie” was brought out, having been cooked for a good 45 minutes on low heat, so it was piping hot and golden in colour – perfect condition for a Pierateer. The pastry itself ranged from quite a thick crisp outer crust to a slightly soggier central pastry lid. The apple was in quite large chunks but was very tasty and soft to cut through. The mix of pastry and apple – with the odd sultana thrown in for good measure – was delightfully balanced content. The capacity couldn’t have been any greater, with no room for air in this pie! Serving at least 12, it was a great sized pudding too. My main criticism is that the central pastry was a bit too soggy, but overall the feedback from myself (and my distinguished guests) was that this really was a luxurious pie. Just next time, I’ll try not to make the error of having such a large portion of dinner beforehand! continue reading "Forget the Christmas Pudding! I want Aldi Pie!" I’m going to have to cut to the chase here. It wasn’t a pie. Nice dessert – yes. A nice orange flavoured chocolate filling – precisely. Worth having again – for sure. But was it a pie?!?!?! Sadly not. 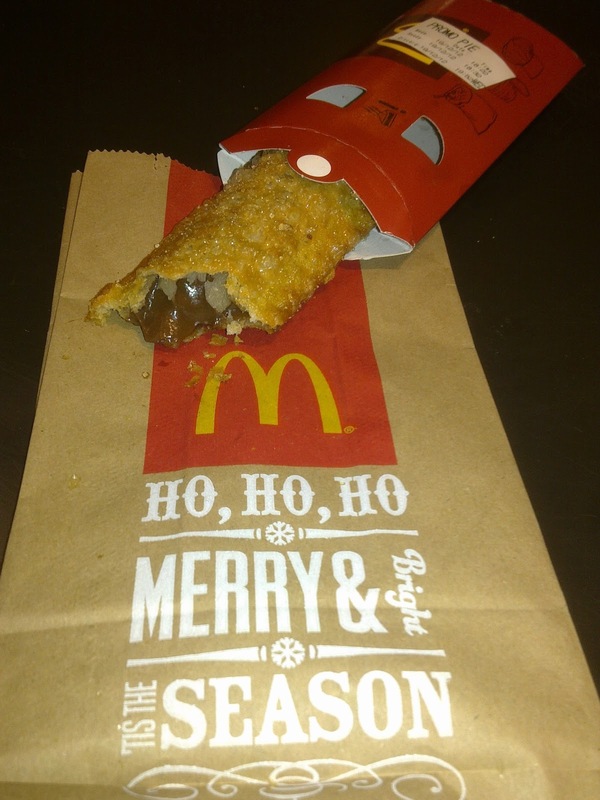 Alas, in this season to be jolly, I’m afraid to say I jolly well won’t be going to McDonalds for my pie fix this festive time! But the idea of a chocolate, let alone orangey chocolate filling, does sound pretty epic to me. Here’s hoping someone creates a proper chocolate pie to enjoy – perhaps someone can add that to their New Year’s Resolution list? From everyone aboard the Pierate ship - Merry Christmas everyone! continue reading "Is it a McPie? 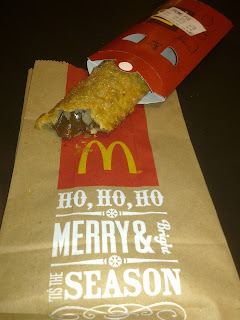 - The McDonald’s Festive Chocolate Pie"
Note: The following pie is no longer being sold by Waitrose in this form, having been replaced by a 'top crust' version. We are clearly disappointed that Waitrose have done this! I don't often pop into my local Waitrose. Mainly because I don't have one. I live in one of the more 'edgy' parts of South London. We don't have many of the kinds of people who go to Waitrose. More the kinds of people who walk down the street talking to a stick or asking for 37p because they went into the pub and 'lost' all their money. So upon finding myself in a Waitrose store I decided to try one of their premium products. I thought I deserved this after taking one for the team and reviewing some of the cheap Tesco Value pies. The slightly unusual flavour of Chicken & Tarragon caught my eye. This pie came in at just under £4 for one which didn't seem great on the Cheapness front. That said it probably wasn't designed to be for one person but I felt up to the challenge. It looked to be in great Condition after a short time in the cookery box. A golden puff pastry lid and shortcrust sides, my favourite. Cutting it open a lovely creamy gravy oozed out. Taking a bite what struck me was the unusually high quality of the chicken. 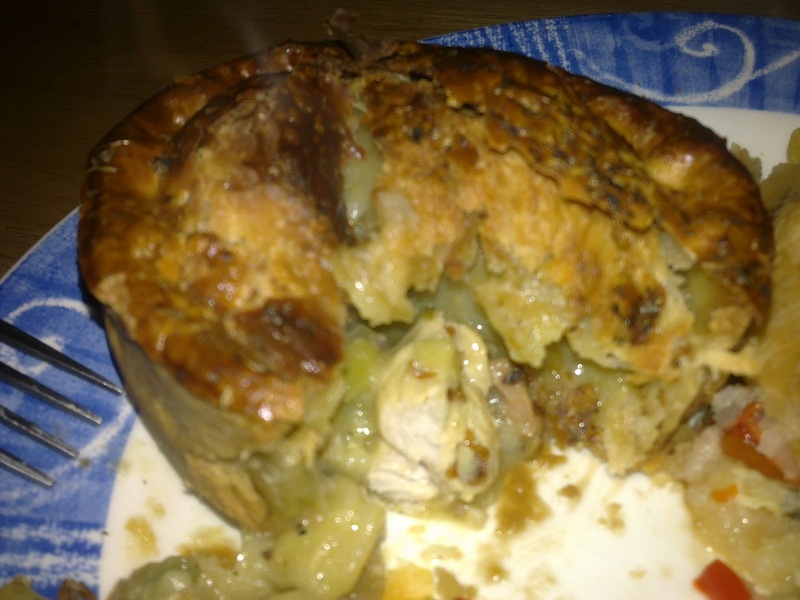 It didn't taste at all reconstituted or pumped full of water like too often is the case with supermarket pies. The next feather in the cap for this pie was one of the holy grails for the pie lover. Pastry crispy on the outside but gooey on the inside. It was really a delight to eat and one of the best pies I have had in a while. continue reading "Good Things Come to Those Who Wait(rose)"
So 1,132 days since we first started blogging about our love of pies, we have finally taken our pie craving to Twitter! We'll be tweeting about all sorts of pie-related things - steak pies, apple pies, pie crust, pie recipes, you name it - and we'd love you to become a follower! continue reading "The best pie blog is on Twitter!" On a cold December lunchtime, the Christmas tree and festive decorations welcome locals into the Sacks of Potatoes pub in central Birmingham. But to be honest, for me, all they needed were the “Turkey and Sausage Pie” adverts that seemed to adorn nearly every table in the pub, as part of their festive menu. I was sold. After all, putting the traditional Roast Turkey aside for a minute, what better festivity than to share a Christmas Pie with all the meaty trimmings?! And that’s exactly what you got. None of the sprouts and other veg getting in the way of this pie, oh no! Just the Christmas meat, a bit of cranberry sauce and the pastry! 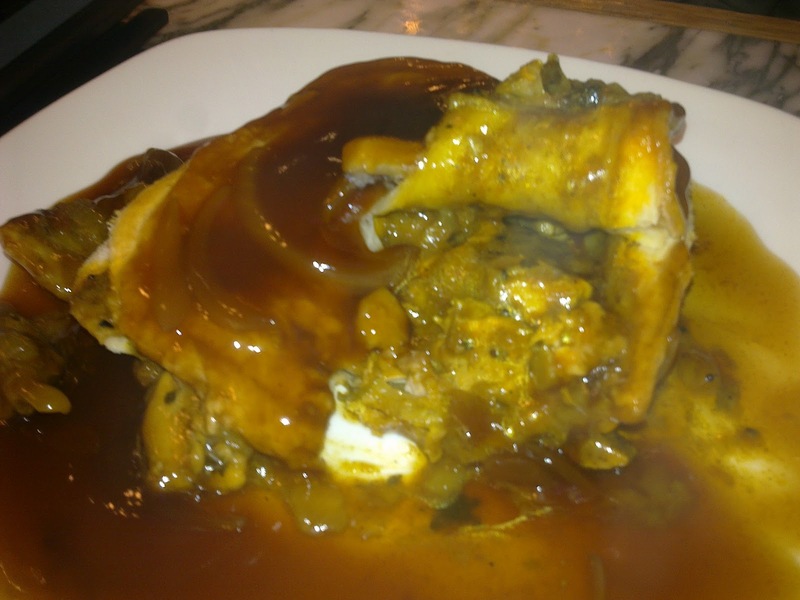 The pie was nicely filled with chunks of meat – particularly turkey – with nice poultry friendly gravy, and a crusty pastry. The pastry did provide slight extremes, with the edge of the slice of pie being quite crisp but a slightly soggier pastry centre due to the gravy, but this was still very nice. The main downside to this pie though was an overly thick lining of cranberry sauce just inside the pie crust, which meant that certain mouthfuls of pie were certainly sweetly overpowering. I’d rather the cranberry had been a side option, rather than taking over the tastebuds for mouthfuls of pie, but overall the meatilicious content of the pie won me over. The Christmas pie revolution seems to be taking off, with pies adorning pub festive menus. And at £5.95 for a pie dinner and drink, it’s decent value too. It’s a great alternative to the standard roast – perhaps a Boxing day treat for those Christmas leftovers? What’s important though here is that they stuck to their guns with the traditional turkey and a focus of meat, meat, meat! Nice one. Merry Christmas everybody! continue reading "All I want for Christmas is... meat pie!" Sainsbury's Taste The Difference range brags that you can literally, taste the difference. However, it doesn't specify what you are trying to taste the difference between? This Pierateer decided to try and taste the difference between two pies, utilizing the offer of 2 pies for £5. One pie was peppered beef steak flavour and the other was chicken and ham flavour, and let me tell you I could certainly taste the difference between them! The pastry of both was wonderful. 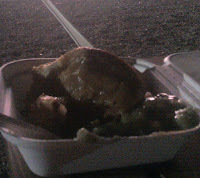 It was light and crispy on the outside with a nice golden colour, and the inside was lovely and gooey, soaked in gravy. The capacity left a lot to be desired though. 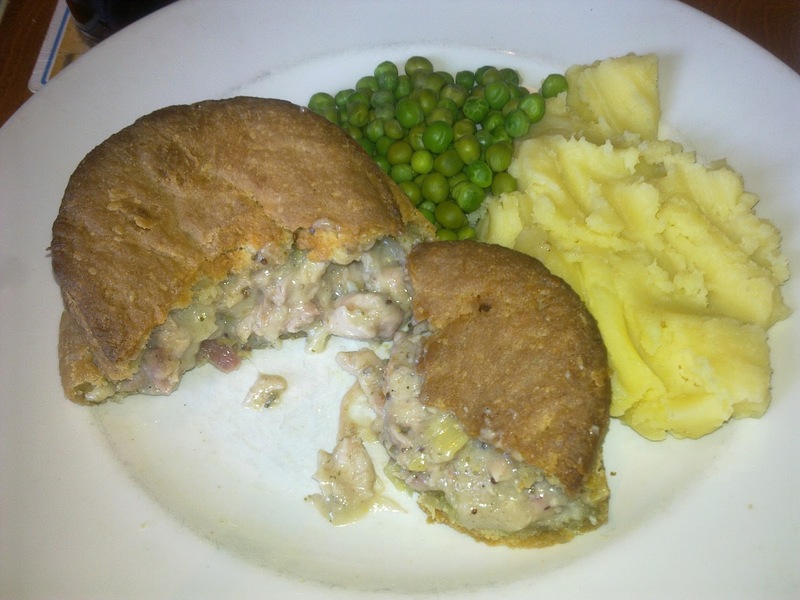 Although only small pies (individual sized), the chunks of meat, specifically in the chicken and ham pie, were few and far between. 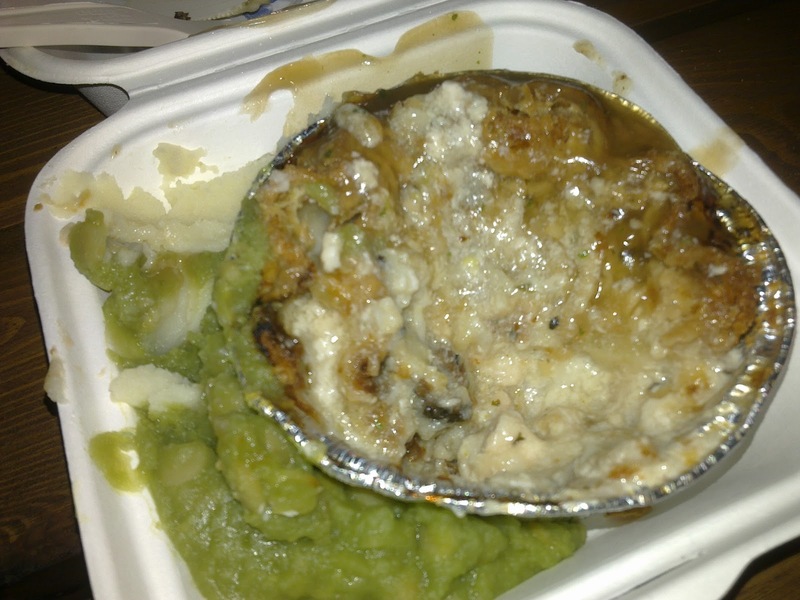 Certainly, I've had pies with worse filling, but for a 'posh' pie I was a bit disappointed. For the steak pie, I didn't really think that it could be bragged as being 'peppered'. There were some whole black peppercorns in there, but it wasn't that peppery. I did enjoy my lunch time snack, and for £2.50 (regular price £2.99) the were probably worth the price, but honestly I would probably rather spend £1.50 on the regular Sainsbury's pie. continue reading "Can you taste the difference? 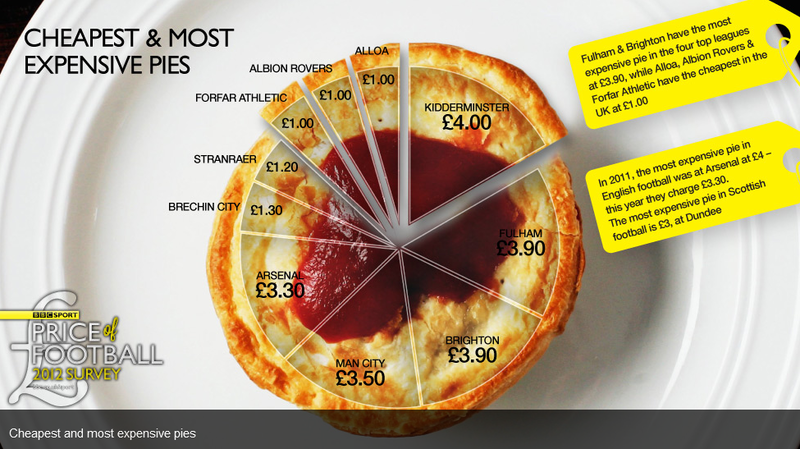 Sainsbury's pie review"
What are the cheapest and most expensive pies at football clubs? After all, cheapness is one Pierate's Seven Cs when assessing for the best pie in the world. continue reading "Half Time Pie"
In the village of Loustri, in the North Eastern corner of Corfu above Agni Bay, they hold a Pie Festival every September. There are competitions for the best pies and local bakers make giant pies which are eaten accompanied by live music and much local wine. This would be perfect, but we were there in May. Fortunately the traditional Corfiot pie can be found all year round in the ancient walled city of Corfu. They are typically sold from tiny shops with only a small window opening on to the street and maybe an old table and chairs in the street to sit on. The chairs are usually occupied by the owner's father and his friend and they are unlikely to move all day. We took our pies to the Old Port Square beneath the fortress for our lunch. So, how do they rate to the seven C’s? Very well, in my opinion. Corfu pies are about the cheapest hot food you will find in this popular tourist location. They are made with layers of delicious crisp flaky pastry cooked until golden brown and served to you hot. Three types of filling are usually available, Spinach, Cheese, or Ham and Cheese and prices were around two Euro. I went for the Cheese and Ham. My pie was suitably full with pieces of ham and a thick rich cheese sauce. This complemented the crispy pastry for a tasty satisfying lunch that ticked all the boxes. I have to admit that the clear blue skies, hot weather and beautiful views probably help with my opinion that this pie would score 6.0. Serve it in England on a wet afternoon and it would probably slip to 5.50. If you are in Corfu it’s not to be missed. One word of warning though, watch out for the hungry sea gulls. Editor: We're glad you enjoyed the pie, and we're very jealous of the sunny weather in Corfu. Perhaps a return visit to Corfu next September might be a good plan for us all? continue reading "Cor! What a scorcher of a pie in Corfu"
continue reading "Memoirs of a Pie Addict"
The Selly ParkTavern was the place to go with friends from the X:site youth event in Birmingham, to catch up on the latest event and have a meal together. And with the night chosen being “Pie Night”, surely it couldn’t have been better timed! 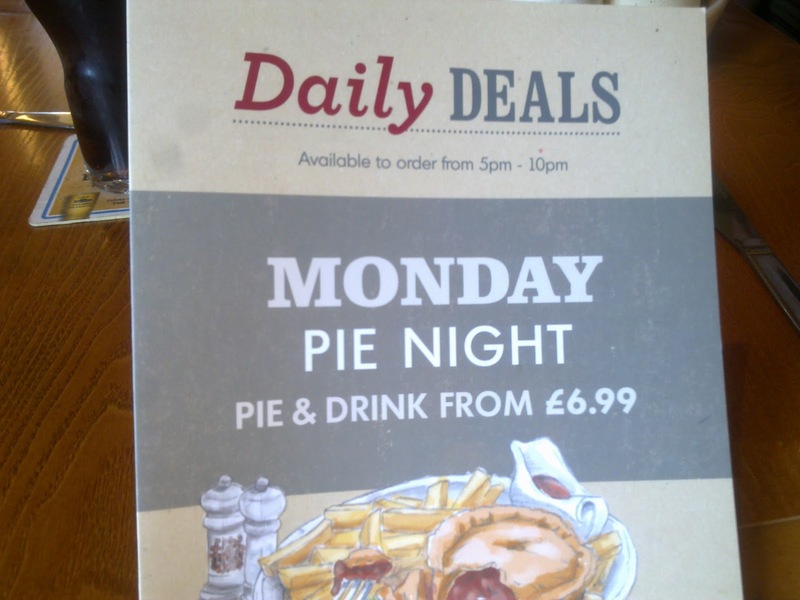 So having ordered my Chicken and Ham Suet Pie, I eagerly awaited its arrival – especially as there hadn’t been even a hint of a discount on the pie despite it being pie night after all! Was it really that good?! Sadly I have to say it didn’t blow me away. The filling was quite a nice consistency with the chicken and ham complementing one another well. It was a nice sauce too. However the pastry left me disappointed. 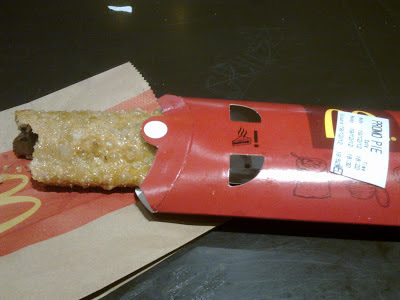 It was rather too crispy and dry on the outside but with the pastry being quite thick the centre was quite soggy. The taste was also quite overpowering. Particularly as the price hadn’t even been discounted for pie night, it was a bit of a blow. There’s certainly better pies on the Ember Inns menu. continue reading "Tasty at the Tavern?" After having tried the Tesco Everyday Value Beef and Onion pie and survived I decided to delve even deeper into the murky depths of cheap pies by getting a whole box of 4 Tesco Everyday Value Chicken and Vegetable frozen pies for a quid. 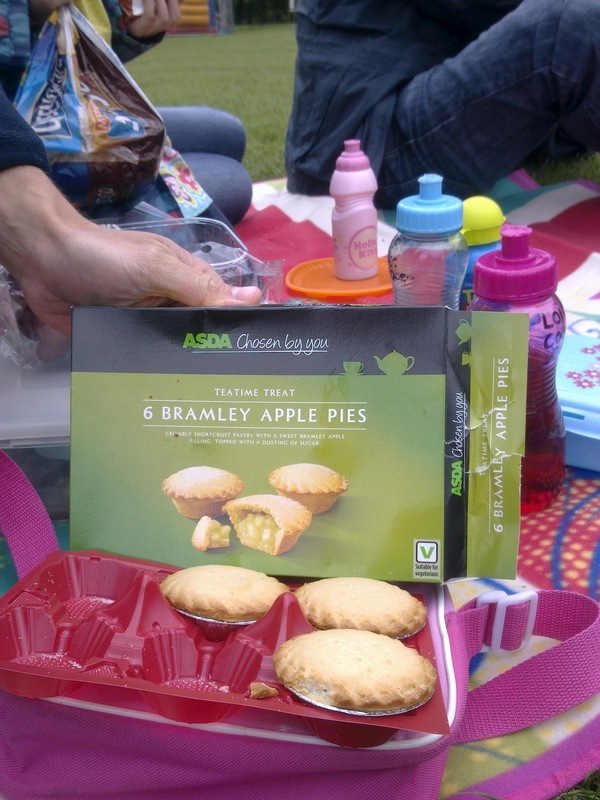 The first thing I noticed was that these pies were pretty tiny which partly explained the cheapness. Once cooked however they did look fairly good with the classic shortcrust base and puff pastry lid combination. It will be of no surprise that once I had cut into the pie no gravy or filling of any description came oozing out. I decided to cut the pie in half to have a closer look. I then separated the contents of the pie from the pastry as can be seen in the photos. It was a pretty poor showing, they didn't even fill it with the cheaper stuff like vegetables, the four peas and tiny pieces of carrot did little to hide the lack of chicken. I thought the filling could fit into a pie about a quarter of the size. Looking at the ingredients this wasn't surprising, it lists chicken breast as 10% and vegetables as 5%. To put this in context most pies we review are at least 50% filling. Everything was coated in gravy but the liquid content of the pie was pretty poor too. With other cheap pies you might expect too much gravy if anything to hide the lack of content, this pie didn't even bother. But despite all this, as with the beef and onion version, the pie didn't actually taste bad. It was certainly edible which is more than can be said for some of the pies we have reviewed. The pastry was overly crunchy but the smear of gravy on it gave some flavour. continue reading "An Unfulfilling Situation - Tesco Pie Review"
I had mixed feelings when I learnt of the demise of the Tesco Value brand. Of course it was low quality but I could remember those days at university when they helped me save a fair few pennies. I learnt to never buy the tooth breaking muesli unless I wanted to eat a mixture of stones and sawdust but there were some products I was willing to buy. At least you knew what to expect and the brand became fairly iconic with other supermarkets bringing out similar brands after the introduction of Tesco Value in 1993. There were even Tesco Value birthday cards for when it really is the thought that counts. So, Tesco Value has been replaced with Tesco Everyday Value, a new much more appealing branding. Tesco also promise that they have improved many of the 550 products in the range. For example, the apple sauce is now to contain 33% more apple! To give our pie reviews some balance I thought this would be a good time to see how the cheapest pies stacked up against their much more pricey rivals. After all they would undoubtably score highly on cheapness. I opted for a pack of three Beef and Onion pies for £1 which makes these some of the cheapest pies I have ever eaten. As you can see from the picture, they didn't look too bad, the condition was good. As soon as my knife cut the pie open however I thought these might be some trick 'air' pies like the pound shop versions we reviewed before. The filling wasn't immediately apparent, there wasn't a lot, as would be expected from these cheap pies. Taking a bite, I can safely say this wasn't the worst pie I'd ever tasted. In fact it didn't actually taste bad. The pastry was okay, it had a satisfying crunch to it. The meat in the filling was ground up so finely you couldn't actually tell that it was snouts and entrails and there was no need to chew. I saw a couple of tiny pieces of onion floating around too. Certainly this pie was below average but it was not quite as bad as I was expecting. P.S. 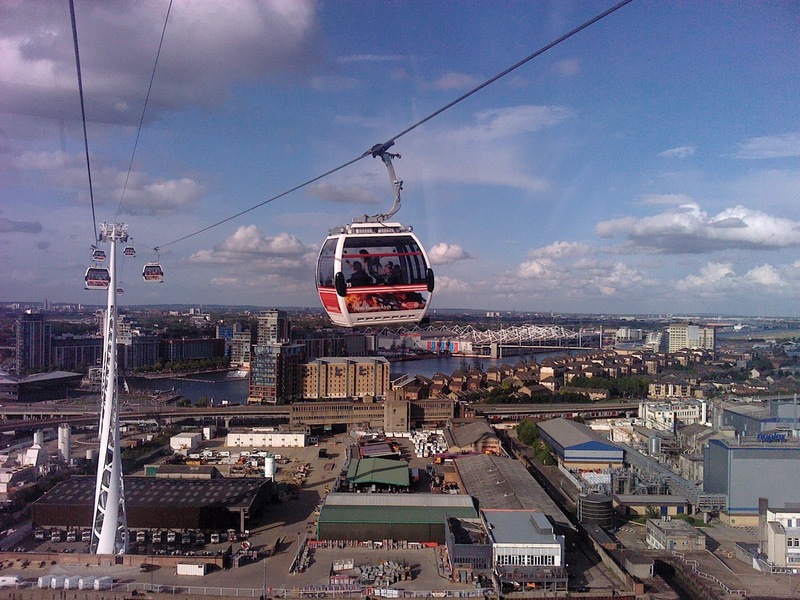 This is our first ever post in September, strange how these things go isn't it? 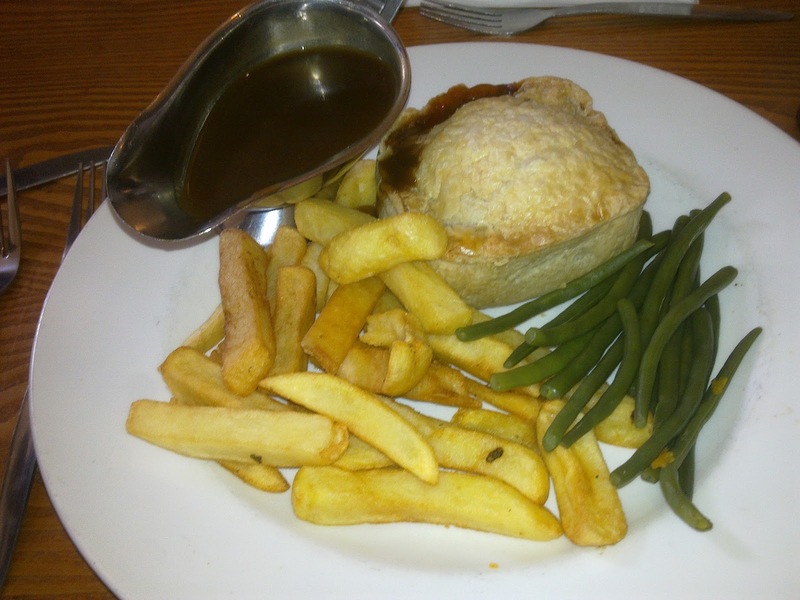 continue reading "Not Everyday Pies from Tesco"
In the pie reviewing business you always have to be on the look out for where the best pies can be found. There are just too many pies out there to review them all, no matter how hard we try. This can involve reading about pies, attending gourmet pie shows but most important of all, following up recommendations (see 'Suggest A Pie'). This leads me on to a place in Reading which I have had recommended to me by a few people. The fact that it has such a formidable reputation gave me high hopes for something special. The place in question is called Sweeney and Todd and what a brave name that is to give a pie establishment. 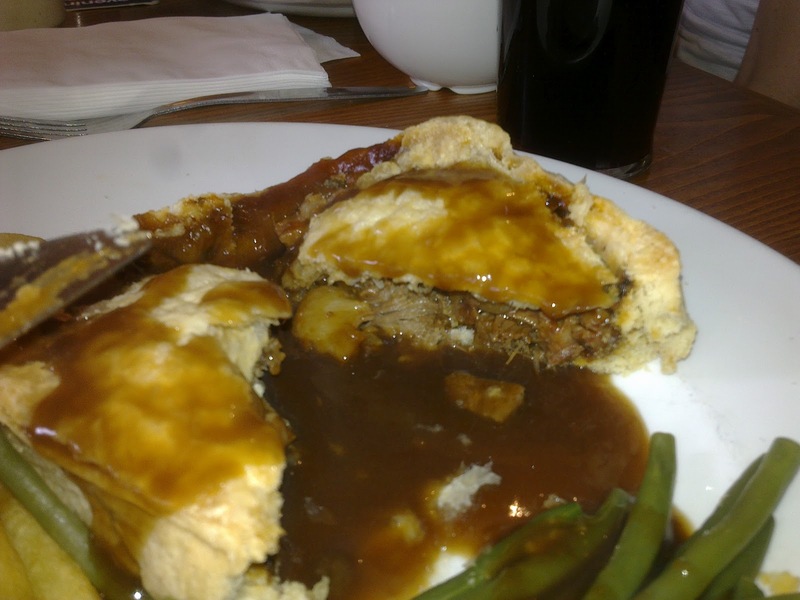 It is take away or eat in with some roasts and casseroles available but the main focus is always on pies. My first impression was... where is it? The outside of the establishment was fairly nondescript. In fact it looks pretty run down and quite unappealing. Despite this there was a queue out the door, which hinted there must be something pretty good inside. Too many of the modern pie shops which have sprung up recently look fantastic but do nothing special with their pies. 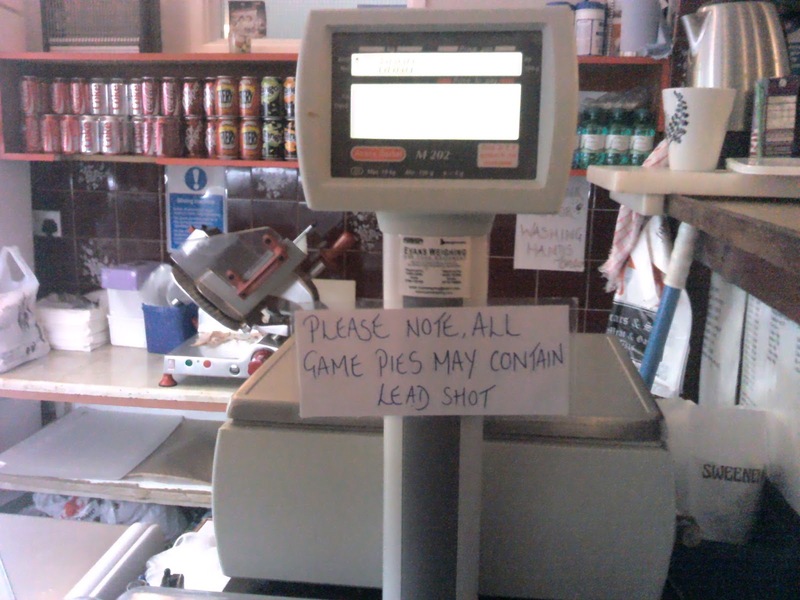 Sweeney and Todd certainly do something special to their pies (but hopefully not that...). Once I got into the shop and surveyed the magnificent selection I could tell they had a special cooking method. These seem to be pies cooked inside a pie mould, which stops the pies drying out and gives the pastry a fantastically gooey texture. I opted for a Vicar's Pie. Vicars is the name of the butcher's in Reading which provides the meat for the pies. I deduced that the pie contained lamb, pork, carrot, potato, leek, mint and potentially some other ingredients as well. The combination was a bit unusual and the gravy had a delicious thickness to it, almost like jelly. The only slight criticism I might have is that there was a lot of mint, verging on too much. This certainly didn't stop this being one of my favourite ever pies. The meat was great quality and at £3 this pie was cheaper than many other pie establishments. 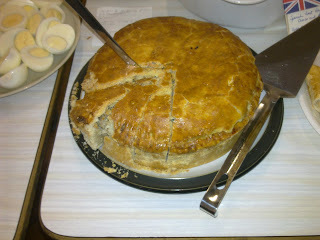 I would note that one of my pie eating companions had a pork and apple pie which had far too much apple in it. It was like eating a sweet apple pie with pork in. 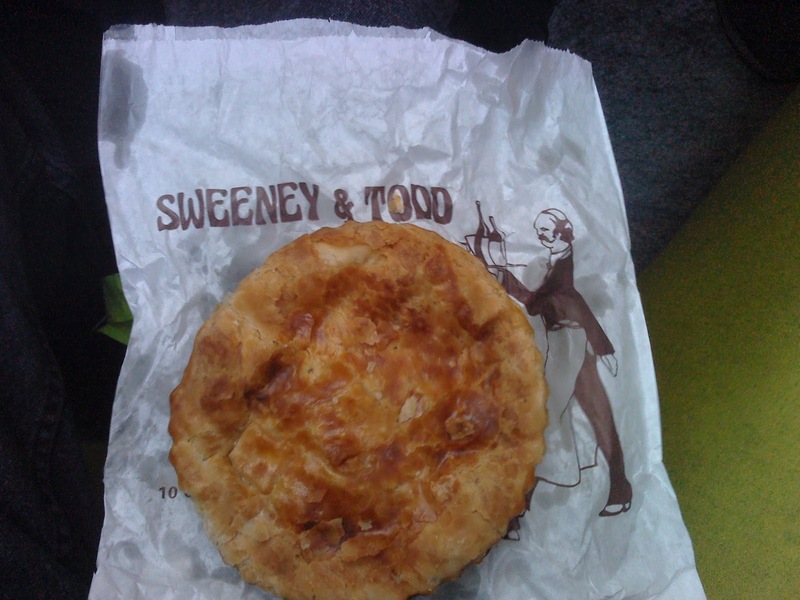 So Sweeney and Todd are not perfect but for a pie lover it would be barbarous not to murder one of their demon pies. continue reading "Reading About Pies"
As Boris Johnson famously said at the handover of the Olympic games to London "ping pong is coming home ... where as the French looked at the dining table and saw an opportunity to have dinner, we (the British) looked at a dining table and saw the opportunity to play Wiff Waff (original name of table tennis)." Fortunately the British did also see the opportunity to have dinner at the dining table and Wiff Waff was not the only British invention to grace the table. British cuisine is often forgotten or derided internationally. This was why it was nice to see a selection of British food available to an international audience when two of the Pierateers went to see Olympic table tennis. 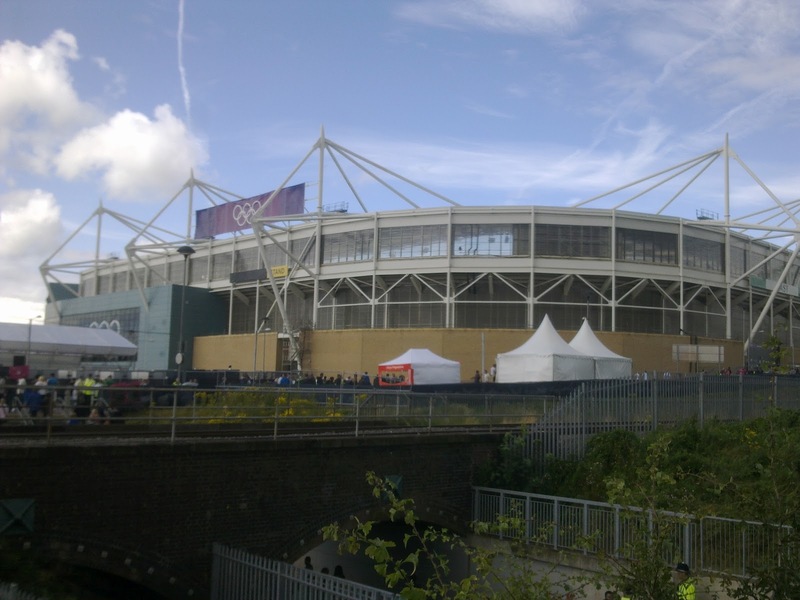 The venue was the ExCel Centre in London, a humungous conference centre big enough to have multiple temporary arenas constructed inside. 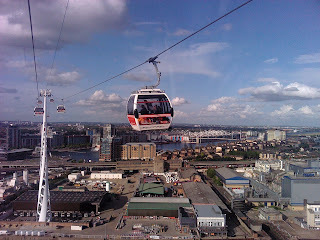 The Pierateers arrived in style taking the new cable car across the river Thames from Greenwich Peninsula to the Royal Docks. Despite only lasting a few minutes the experience was worth it for the views alone. 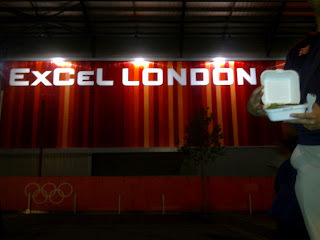 The Pierateers saw the quarter finals of the Women's Team matches Singapore v. North Korea and South Korea v. Hong Kong. In terms of pie experience Hong Kong clearly has an advantage however this didn't help as Singapore and South Korea both ran out 3-0 winners. There has been plenty of talk, even on these pages, of Olympic food and pies being expensive. However, upon leaving the Pierateers were delighted to find someone directing people to the pie stall for half price pies. 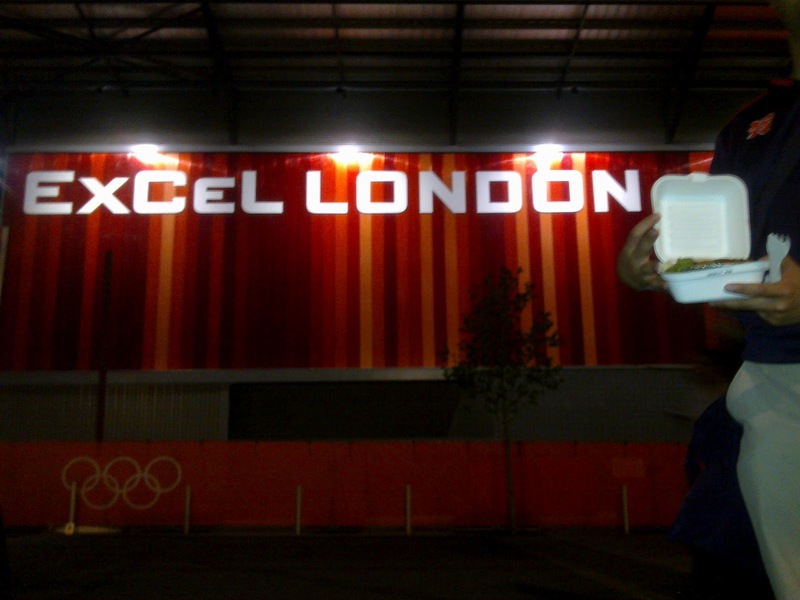 The normal price was £7 for pie, mash and peas, which didn't seem so bad for a meal in a sports venue. However, £3.50 was an absolute bargain (though we do of course consider the price as it would normally be sold, not the special offer price, when rating cheapness). You might think they were selling dried out pies cheap at the end of the day but far from it. Both pies has nearly perfect levels of crispiness of the pastry. There were multiple pies on offer so the Pierateers chose one Chicken and one Steak. 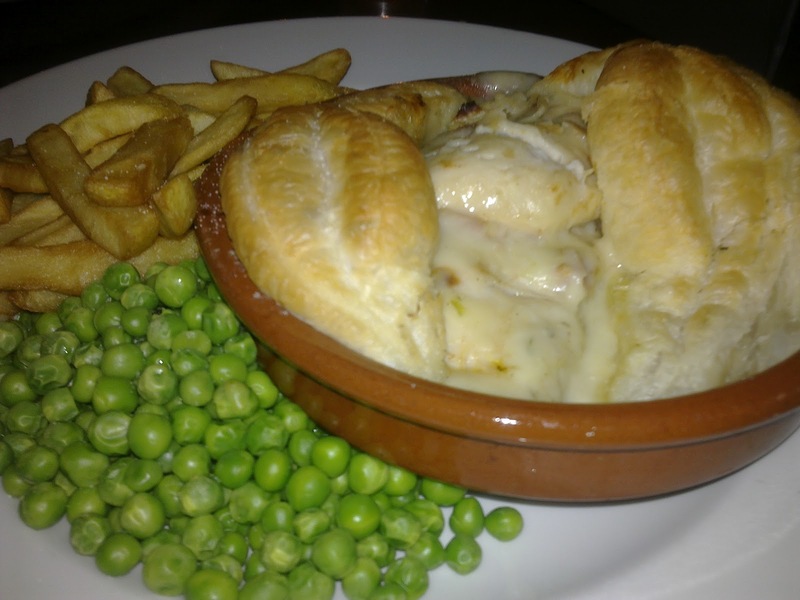 The chicken pie was complemented for it's crisp and delicious pastry and large chunks of meatylicious chicken. The sauce was nice and creamy. This would clearly inspire a generation of pie eaters. The Steak pie was much the same, the meat was fantastically tender. The pastry perfectly gooey. Despite already having eaten dinner this Pierateer could have eaten another of these pies they were so good. Given this unique opportunity to showcase British pies it was great that the organisers put the emphais on quality. So often at sports venues, because of the capitive audience the food is mediocre. 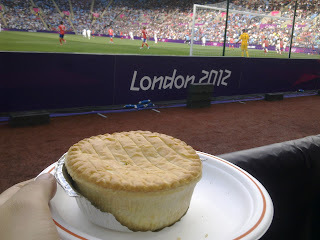 These pies are another great performance and surely a gold medal to cap off a wonderful Olympic games for Team GB. P.S. The company providing these pies was Creativevents, if you are ever organising an Olympic games they come as highly rated caterers. continue reading "ExCellent Olympics Pies"
Visiting the City of Coventry Stadium for the Olympic men’s football, I had a bit of time to kill between watching Mexico beat Gabon and the start of the South Korea-Switzerland tie, so what better way to spend that time than in getting that first Olympic Pie under my belt?! I went for the Steak Pie...because, well, that was sadly the only pie on offer. But in any case, steak is one of my favourite flavours, so the limited selection wasn’t going to put me off! Queuing up was however a bit of a mission, with hundreds of fans streaming out of the stands to get their footie pie fix. Fortunately I had my good friends Gavin, Joel and Christine to chat to in the queue, and to ease the disappointment when I found out that having queued for at least 30 minutes, I would have to wait a further 10 minutes to get my hands on the food, due to exceptional demand for pies! I can’t say I’m surprised though, because when I got to dig in it was delicious. 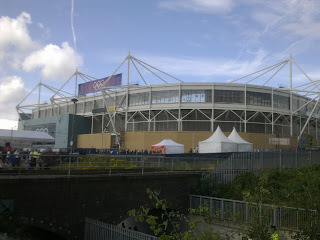 continue reading "Olympic Pie: Football at London 2012"
The Pierate Ship gets an update! continue reading "The Pierate Ship gets an update!" 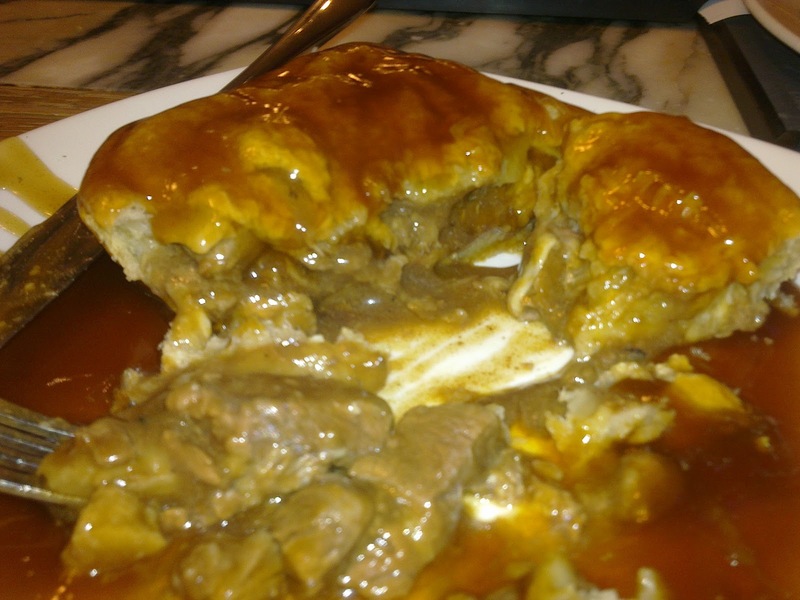 The Steak and Cheese pie was a high quality offering and the meat was particularly good, however the reviewer felt it was too salty overall which meant that the reviewer couldn't manage to finish the whole content of the pie. The pie was expensive, but it was evident that they cared about the condition the pie came in. It was a nice, vintage pie, with light pastry and a spicy but not too hot filling. It packed a flavoursome punch. The pastry was nice and light, gooey and complemented the contents well. A bit too pricey but one thing I would say is that the pie was certainly filling, so this more than made up for the cost. The pastry was nice and light, with no thick side crust which can be the downside of many a pie. The content was very nice, with good chunks of tasty steak. 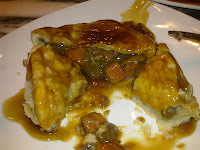 The gravy was also very good, and the mix of content between the steak, kidney and chunks of carrot worked well. The price was quite high but for a filling pie it was worth the expense. So there you have it - the #100thPie reviewed and here's to the next 100 pie reviews! 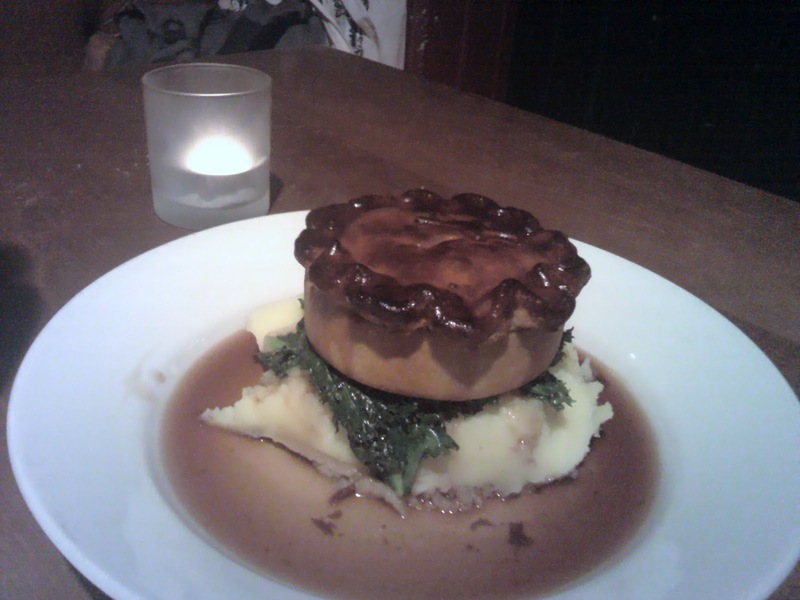 continue reading "#100th Pie Review - Square Pie"
Many have guessed at why The Soak has acquired its name, but right in the heart of Selly Oak (S. Oak...Soak...) it certainly provides a nice friendly place to meet friends and have a pie. 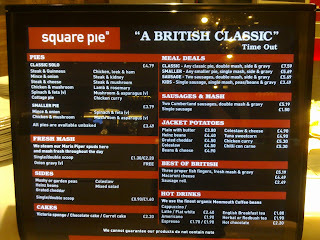 I went for the classic option – Steak pie. 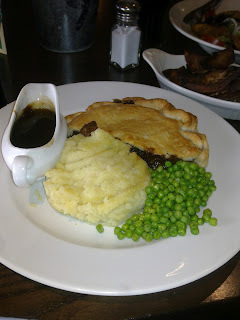 As you can see from the photo, it came with mash, peas and a gravy boat. The mash was not too appetising it had to be said, but the pie was certainly a whole lot better. The pastry was golden and not too thick, and the meat and gravy was pretty decent. It was odd being given a half-slice of pie, as it did make me wonder who had taken the other half, but it was a decent enough pie. Nothing to write home about, but certainly okay. continue reading "The Steak Pie’s Soak-ay"
The Green light’s on for a recommended pie! So on a Sunday lunchtime, what better plan after the morning City Church service than to enjoy a nice pie with some lovely friends from church*. And so, going to one of our regular post-service haunts, we headed to the Green Man pub in Harborne (part of the Ember Inns chain). And to my delight, the chef’s recommendation was for a very nice sounding pie – which fortunately they still had available on the menu (so no need to get green with envy!) There it was – the Steak, Stout, Baby Onion and Pancetta Pie! It pretty much had my name on it, especially with the meatylicious content and a recommendation from the chef themselves! And the good news is that it was certainly worth its recommendation. The steak and ham content blended well together, making me wonder why I had never had this meaty mix before, and the gravy was very nice and complemented the pieces of meat well. I did feel the number of baby onions slightly exceeded the requirements, given that this wasn’t the biggest pie in the world, but it was still very filling. It certainly made the pie quite expensive for its relative size, however the quality of it more than made amends. The light butter pastry was particularly nice and was packed to capacity -you can even see in the photo that the content was trying to ooze out of the lid! 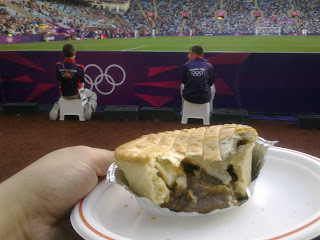 All in all, it was a delightful tasting pie which I’m sure to have again sometime soon! 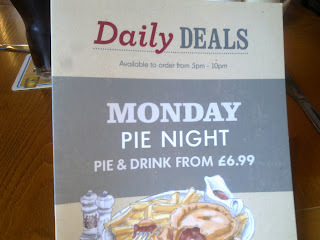 And hopefully I'll be there on Monday's Pie Night next time! continue reading "The Green light’s on for a recommended pie!" Yes, you guessed it. The “open chicken pie” is basically a top crust pie without a proper top crust! There’s a massive, gaping open hole in the lid. It‘s like rubbing salt into the wounds, like stealing the last penny from a guy who’s just given generously to charity, like removing the penultimate piece of pastry from an already pastry-light pie... no, wait, it IS removing the penultimate piece of pastry from an already pastry-light pie. And why in the world would you want to do such a thing?! This is not the time or the place to discuss top crusts (plenty of previous reviews have already gone there), but it then beggars belief as to why you would remove pastry from a top crust pie?! Surely you should just forget the pastry all together and just serve it as it is – a glorified, sauce covered piece of chicken in a dish! It’s at this point that I do have to admit, much to my obvious annoyance at the lack of pastry and initial thoughts over whether it was even a meal that could be classified as a pie in the first place, that the meal was actually very nice. Annoyingly nice, in fact! It shouldn’t have been so nice, considering it barely counts as a pie! But there you go, beggars cannot be choosers. The pastry was light, crisp and golden. The chicken sauce was delightful and the chicken pieces very filling. However what I would say is that the Slug and Lettuce Pub chain are really missing a trick here by not encasing their pie fully with pastry, as this could have ranked as a top 20 pie had they done so. But alas, this will forever be recorded as a “what might have been...” entry. Note to self: when it says “open pie”, prepare to be outraged! continue reading "Open Pie Outrage!" Yes, it cannot go unmarked that on 5th July the pie rating blog www.pierate.co.uk received its 15,000th page view, and continues to grow. (We were clearly so busy eating pies we sadly were a week late noticing it ourselves!) Spurred on by knowing they are so close to gaining their landmark 100th Pie Review (from here on in, know as #100thPieReview), the Pierateers are continuing to eat and review every pie they can get their gravy soaked hands on. 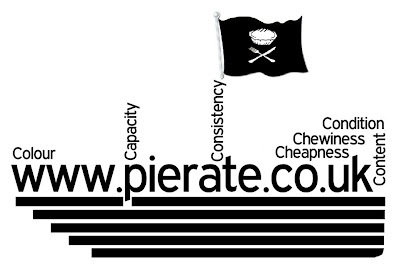 And the business ideas are already flowing for the creation of pierate merchandise, with a new logo from the Pierateers set to be launched when the 100th Pie Review is done. Keep your eyes on the pies and be sure to come back soon to the World's most popular pie rating blog! 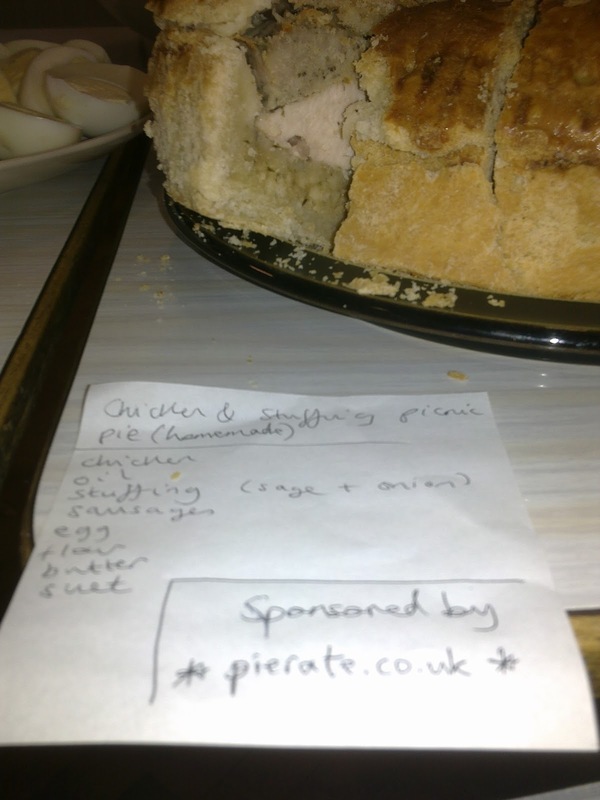 continue reading "15,000+ page views as the Pierateers hone in on 100thPieReview"
It is great to see that these days people are buying more local food. We have become conscious of the ridiculous journeys our food sometimes makes to the supermarkets. For example the story of Scottish chicken being taken on a 1,000 mile round trip to be processed. This is a case of the environmental costs being ignored and is not sustainable in a world where we have limited resources and a growing population. There is also the important fact that local food tends to be fresher and taste better! Local Roots in High Wycombe specialises in satisfying this taste for food and drink where a trip to the country of origin wouldn't require a passport. I got hold of a Fruity Pork pie for £3 from their store which can be sold hot or cold. I was skeptical about such a flavour at first because I don't tend to like mixing sweet and savory food. However I was caught off guard by a completely unexpected flavour sensation! I would describe it more as a Spicy Pork pie. It had flavours that reminded me of a mince pie. There was a definite aniseed type flavour which might have been fennel. It was hard to identify what the other spices might have been. In addition there was onion to keep the pork company. This might all sound a bit strange but it just about worked as there was as much spice as there could be without it being too overpowering. The pork was tender and the pastry was melt in the mouth. There was not much gravy but the pie was moist enough without it. It is great to see such originality in this twist to a winning formula. Having said that, I wouldn't put it on my 'desert island pies' list as it goes so close to being overwhelming in its intensity. But as a Pierateer, although eating lots of pies is always a pleasure, it is too often a case of 'pie by numbers' so this pie was a breath of fresh air and the experience is recommended. continue reading "Are You... Local?" 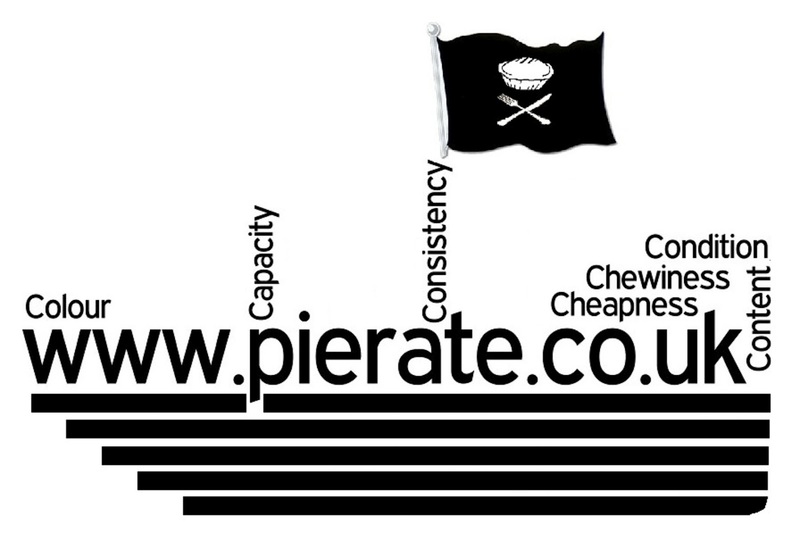 Welcome to another edition of the pierate blog. My name is Simon Pyeman and I have been asked to conduct a series of investigations into the group of pie bloggers who call themselves 'The Pierateers'. A mysterious bunch they can be difficult to track down. I have today discovered the South London residence of the Pierateer known as SJL. It is a slightly dodgy area to be honest. There were riots here last summer. Rumours abound the riot was caused by a local pie shortage. Okay, so now we are inside SJL's flat, there is a smell of last night's pie in the air. There are many posters and pieces of art work on the walls, all of them pictures of pies. He has a pirate costume with the hat shaped like a pie, it is all exactly as I expected. Now to the kitchen which is surely where you want to visit! The cupboards are as anticipated, plenty of different types of stock and some flour; important for making pies. There is an abundance of gravy, the vital sidekick, like Robin to the Pie's Batman. However, I am surprised to find ready rolled pastry in the fridge. I would have thought SJL would have perfected the art of pastry making. Next I check the recycling for any discarded pie boxes. 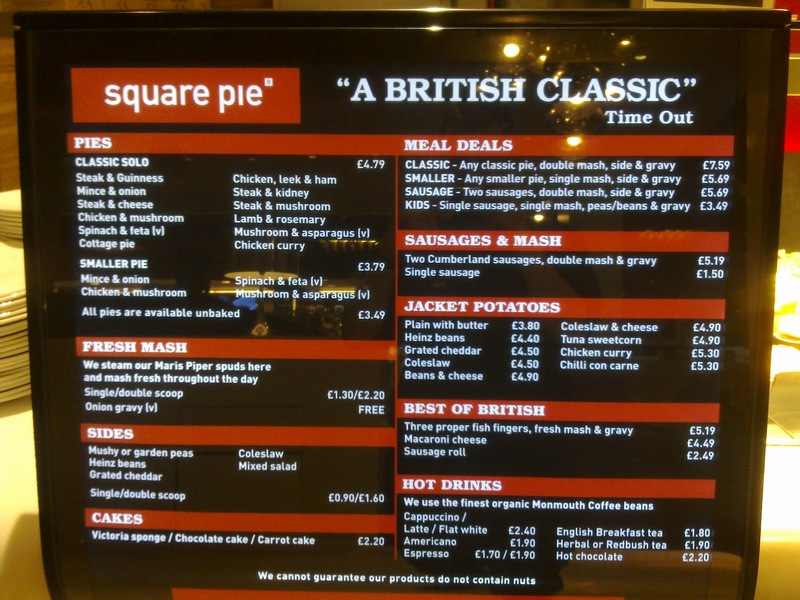 To my shock, I find not gourmet pies but a Ginsters Chicken pie box. Just as I am mulling over this disappointing find in walks SJL. “Admittedly the meat seemed quite processed but it wasn't at all chewy. There were ample amounts of a thick, peppery, creamy sauce which was great. The pastry was good and had a bit of crunch. Trust me, I didn't want to like it but I did. The condition wasn't great though, looked nothing like on the box." continue reading "Ginsters Pie is the Perfect Tonic"
Before I start, let me just clarify that no Peppa Pigs were harmed in the making of this pie. And also that Peppa Pig didn’t eat all the pies, as I fortunately got my hands on one before we met her. 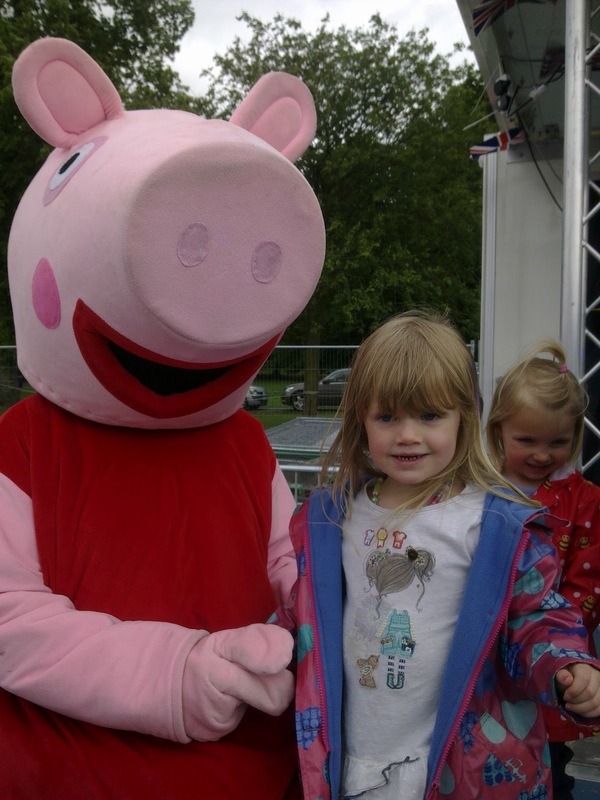 continue reading "(Peppa) Piggy in the Park"
When a type of apple has its own website, you know you’re branching out in the right direction. So while I’ve been rooting around, leaving nothing to chance, I’ve found a lot of information about the contents of our latest pie review. Don’t worry - I’ve not gone barking mad, but I've got to the core of the issue, and yes, you’ve probably twigged by now: I’m talking about the humble Bramley Apple. And what an apple it is! A mainstay in many a great apple pie, the Bramley Apple (circa 1809) has become firmly rooted as a fan’s favourite in the sweet pie world. 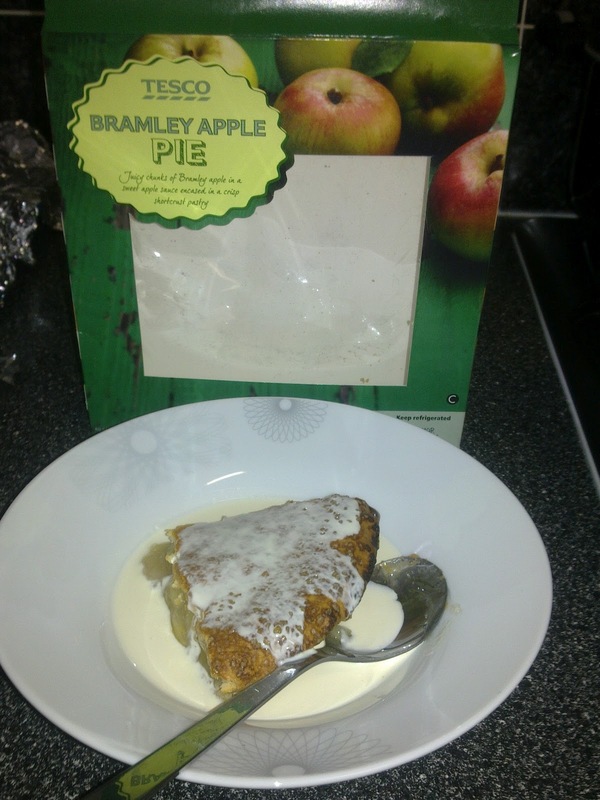 So it’s great to see Tesco getting on board with their Tesco Bramley Apple Pie! And as it says on the box, it really does contain juicy chunks of Bramley apple in a delicious sweet apple sauce. I had my pie with evaporated milk and it was very nice. 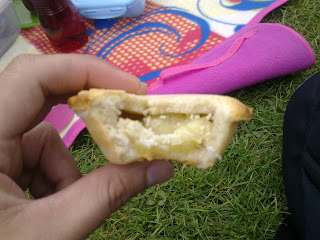 The short crust pastry was lovely and crunchy and the apple sauce was particularly good. While not blown away, it was a very reasonable pie and I would certainly commend it. Good work, Bramley! continue reading "The Great British Bramley by Tesco"
So let’s get down to business – how would the ‘chicken of aragon pie’ by Pieminister fare? Could it really be the perfect pie, as they claimed? After all, it does say it’s award winning on the front (though I’m not going to go all Rhod Gilbert on you and write letters to my local Pieminister outlet demanding info on what awards it has won...particularly as you can see the list on their Pieminister website!) So as you can see, the pie was filled with big meaty chunks of chicken, though the pieces of bacon mentioned on the box were tiny and few and far between. The rest of the ingredients did compliment each other reasonably well, however I have to admit to feeling slightly underwhelmed by the chicken sauce present in my pie. Certainly nothing to write home about and I’ve had plenty of better chicken pie sauces in my time. The pastry was very crisp and the condition of the pie was pretty good, especially considering the state of the box the pie came in! Capacity was good and the pastry was a golden brown. All in all, a decent pie, just nothing to get too arrogant about just yet! continue reading "Arrogance about the aragon? 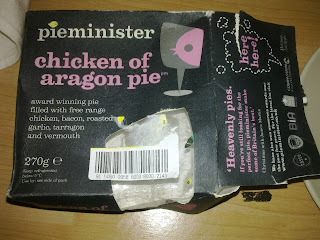 Pieminister Chicken of Aragon pie review"
Young at Heart or Burnt Out? I recently paid a visit to the lovely Old Ship pub on the banks of the Thames just down from Hammersmith bridge on my search for London Pie. Owned by Young's brewers, they had a small menu which I was pleased to see still saved a place for a Young's Steak Pie. Apparently this was to come served on a bed of mash and kale. Intriguing, but I had to remember to focus on the pie and not the sideshow that was to come with it. Unfortunately when my pie came to be served it had fallen off it's glorious vegetable perch. This slightly detracted from the presentation. However, it didn't hide the more noticeable fact that the top of the pie looked to have taken the crispy golden brown colour to the extreme. So much so that it looked dangerously close to being called 'burnt', the dreaded antithesis to the seven C's that we use to score our pies. A burnt pie can lose points on Colour, Condition, Consistency and possibly even Chewiness if it is really bad. 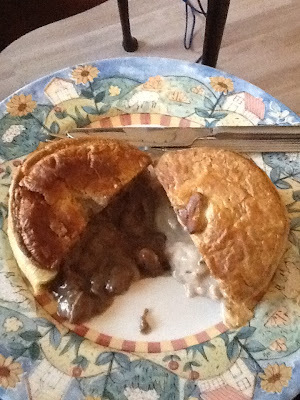 But, perhaps this pie was supposed to come 'well done' I had after all not specified for it to be medium-rare. The first stab with a knife and the pie oozed glorious gravy. The pastry, especially around the sides where it wasn't burnt, was fantastically gooey. The pie had a great Capacity which was packed with Content. However, the first bite confirmed my worst fears. Credit where it is due, the initial taste was certainly what you would expect from a gourmet pie. However, behind that was an all too familiar bitter carbon tang. Like burnt toast, it was so disappointing because this pie could have been in the upper echelons of the pie rankings. My pie eating companion for the evening said that he quite liked the burnt flavour. However he claims that 'pasties are a type of pie'. Clearly he is not fit to judge pie flavours so this view can be safely disregarded. Overall however, I did really enjoy this pie, it certainly did not ruin the experience. The mash and kale in particular were done to perfection. On another occasion I'm sure this could score better but we can only rate what is put in front of us. For the price of a bit over a tenner it is certainly above average for a London pub. continue reading "Young at Heart or Burnt Out?" To mark Queen Elizabeth's 60 years on the throne and as part of the Diamond Jubilee celebrations, the Senei produced a royally good pie! Provided at the Jubilee Lunch, hosted by City Church Birmingham, the red, white and blue bunting, flags and decorations by the children only added to the carnival atmosphere, as I dived in to grab the first slice of homemade Chicken & Stuffing Picnic Pie. The first thing to note were the nice chunks of chicken that were spread throughout the centre of the pie, giving every slice of pie that meatilicious content every savoury pie reviewer craves. The chicken and stuffing worked perfectly together, combining well with the nice thick pastry coating. I must have picked the perfect slice, as it did not crumble until the last mouthful, and while I did spot a few slightly crumbling slices on other people’s plates (notably the chef and chefess themselves), it was indeed a very fine and well crafted pie. And even better – it did not cost me a penny! It was packed full of content, my only slight criticism being a slightly higher content of chicken would have rounded it off perfectly, but all in all my first taste of Chicken & Stuffing Picnic Pie has left me craving for more! Bring on the 70 year celebrations! The Queen would have certainly given this pie her royal seal of approval! 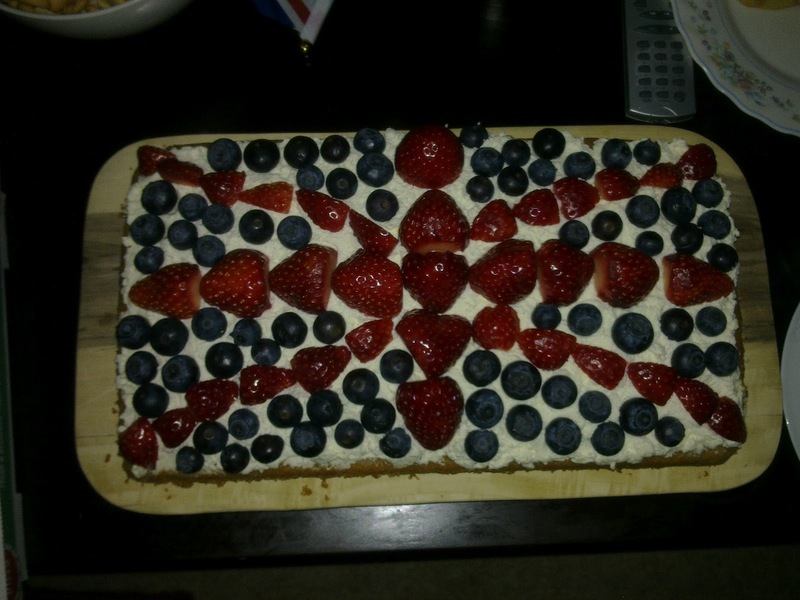 A great pie to celebrate the Diamond Jubilee weekend with! 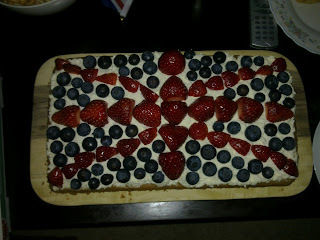 Bryony's patriotic Jubilee Cake, eaten at another Jubilee celebration! continue reading "A Royally Jubilicious Pie"